I found Cap'n Crunch's Halloween Crunch at K-Mart about a month ago. Back side of the box was a pumpkin template. There're 2 colors of cereals inside. Yellow square shaped cereals are regular flavor and shape, and the pink pieces were ghosts, and they turn milk green, according to the box. 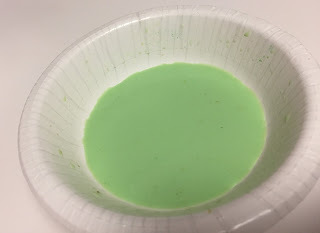 Shortly after the milk was poured, the milk didn't turn green. In about 10 seconds, the milk started turning into light green. The more time had passed and more pink had cereals touched the milk, the richer the green had become. Other reviews of Cap'n Crunch.